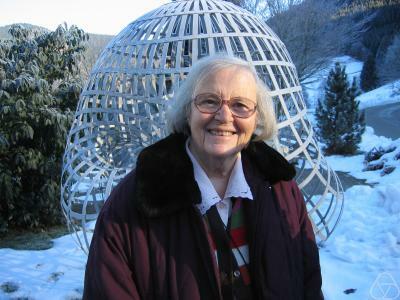 Yvonne Choquet-Bruhat is a French mathematician and physicist, renowned for her pioneering work on the initial value problem of General Relativity. Her work was one of the “Milestones of General Relativity” featured in a recent CQG focus issue. She has been on the faculty of the University of Marseille, the University of Reims and the University Pierre-et-Marie-Curie in Paris. She was the first woman to be elected to the French Academy of Sciences and is a Grand Croix of the Legion of Honour of France. She is also an elected member of the American Academy of Arts and Sciences. This reminiscence of Einstein was presented at the conference “A Century of General Relativity” held in Berlin, 30 November to 5 December, 2015. This image of Yvonne Choquet-Bruhat has been obtained from Wikipedia where it was made available by Momotaro under a CC-BY-SA 2.0 license. It is included within this article on that basis and attributed to Oberwolfach Photo Collection. I met Einstein in 1951 at the Institute for Advanced Study in Princeton. I was making there a postdoctoral stay, as assistant to the great mathematician Jean Leray, a part-time permanent professor at the IAS. I had defended a thesis on General Relativity under the official direction of André Lichnerowicz, but it was Jean Leray who had encouraged me to attack the problem of the existence of solutions of the Einstein equations taking given initial values, without assuming their analyticity. When I told Lichnerowicz about Leray’s suggestion, he said “it is too difficult for a beginner”. In fact it was not so difficult. In harmonic coordinates, called then “isotherm”, introduced by Lanczos, DeDonder and Georges Darmois, the Einstein equations in vacuum look like a system of quasidiagonal, quasilinear system of second order partial differential equations hyperbolic for a Lorentzian metric. I found by chance an article written in French by the great Russian mathematician Serge Sobolev which constructed elementary kernels for such linear hyperbolic systems. In this article Sobolev introduces generalized functions, now often called “Schwartz distributions”, and uses the elementary kernel to construct a solution of the Cauchy problem. In fact Sobolev’s reasoning in this last step is not quite correct; the convolution he uses proves uniqueness but not existence of the solution. However Sobolev’s ideas allowed me to write non-linear integral equations which have local in time solutions in spaces of functions with a finite number of derivatives. I showed that these solutions satisfy the Cauchy problem for the quasilinear Einstein equations in harmonic coordinates. I also proved that a solution in harmonic coordinates satisfies the full Einstein equations if the initial data satisfy four conditions, now called the constraints, completing thus the proof of the propagation of gravitation with the speed of light. In 1951 Leray was giving at the Institute a course on his current work, the Cauchy problem for general systems of hyperbolic partial differential equations, using the method of energy estimates. His results when applied to the Einstein system in harmonic coordinates give also the existence theorem I had proven, but Leray had encouraged me to complete my proof by the constructive method. I was attending the course of Leray. We were leaving the classroom together when we met Einstein walking toward his office. Leray and Einstein knew each other and Leray introduced me to Einstein, saying that I had defended a thesis on General Relativity directed by Lichnerowicz. Leray said also that I was the daughter of the physicist Georges Bruhat who had died in a Nazi concentration camp. Both facts appealed to Einstein’s sympathy. Einstein knew Lichnerowicz’s name and had esteem for him. Indeed Lichnerowicz had proved a conjecture dear to Einstein’s heart, namely that any stationary spacetime with asymptotically Euclidean space is the Minkowski spacetime if it satisfies the vacuum Einstein equations. Einstein himself, in collaboration with Pauli, had proved the conjecture in the particular case of static spacetimes, but the stationary case is more subtle to prove. Lichnerowicz had made for his proof a clever use of Élie Cartan’s geometric formalism. In fact Einstein’s conjecture was stronger: he thought that the result should hold for any asymptotically Euclidean complete vacuum Einsteinian spacetime. The stronger conjecture has been proved to be wrong in the 500-page work of Christodoulou and Klainerman of 1990. A gravitational field can be its own source. However the physical intuition of Einstein had some truth in it: his conjecture has been proved to be true by Schoen and Yau for Einsteinian space times with zero ADM mass, that is tending fast enough to flatness at space infinity (faster than a Newtonian potential). Returning to 1951: after my introduction by Leray, Einstein invited me into his office. He asked me to explain to him my work. My English at the beginning of my stay in Princeton was not fluent, in spite of my studying it at school for ten years, mainly in Shakespeare’s plays. Einstein told me to speak French, which he understood, but he said that he would answer me in English because he had lost the practice of French. So, that first time, I summarized in French my thesis on Einstein’s blackboard. Einstein listened with interest, congratulated me for the results which gave rigorous proofs of properties he expected from the gravitational field. When I left Einstein told me I would be welcome in his office any time I would feel like knocking at his door, though next time I should talk English so that I could practice it. Einstein was right: I had no difficulty with English in our later interviews. It was too late for me to develop a good accent, but Einstein’s accent was not perfect, either. Free access to Einstein’s office was a great favor. In those years Einstein did not mingle much with other people at the Institute, he did not come to receptions, nor to the daily traditional tea in the common room. He did not come to seminars. It is true that in this period of the early fifties, General Relativity was rather dormant. The subjects in the theoretical physics seminar directed by Oppenheimer were all on quantum mechanics. The problem of quantizing the gravitational field was not even mentioned. I knocked sometimes at Einstein’s door, but I regret that I did not do it more often. I was always kindly welcomed as a young researcher eager to learn from a great scientist, genial but kind and unsophisticated. Einstein looked like a very intelligent old man, quite appropriately dressed in pants and pullover, with socks in his shoes, smiling with benevolence to the young woman I was then. In those years Einstein was working on his last unified theory with his assistant Bruria Kaufman, a pleasant, hard-working woman of about my age who shared his office. She left the US after Einstein’s death to live in a kibbutz in Israel. Though concentrating on unified theory, Einstein was still interested in classical General Relativity and its open mathematical problems. I showed him the small book of 1939 by Lichnerowicz “Problèmes Globaux en Mécanique Relativiste” (in fact his thesis, supervised by G. Darmois). In this book Lichnerowicz constructs what he thinks to be a counterexample to the conjecture mentioned before. Einstein read the relevant section and pointed out that the constructed spacetime did not obey the asymptotic condition of no flow from infinity of gravitational energy assumed in his conjecture. Another time, Einstein encouraged me to prove that his equations have no periodic solutions. Now a few years before, Einstein himself had published a small article in some South American journal, which I had read by chance. In this paper, Einstein claimed to prove the existence of periodic solutions. This article contained a simple mistake, an error of sign which I had noticed. I said to Einstein with a small smile which he quickly deciphered, “but you have proved there are periodic solutions”. The great man answered with another smile “But this article was not quite correct”, and I said “I noticed that”. An ordinary man would probably have held a grudge against me. On the contrary Einstein, after this, showed me greater kindness. In my later visits, Einstein explained to me on his blackboard the non-symmetric theory he was then working on, its successes and its difficulties. I brought him the book by Eisenhart “Non Riemannian Geometry“. He thanked me, though I don’t think this book was of any real use to him. I worked a little on this last Einstein theory. The equations in spite of some nice features are very complicated. I obtained some calculus results, computing the connection coefficients, but they led to no valuable theorem. In fact I was doubtful of the physical significance of this theory, interpreted at that time as unifying the gravitational potential and the electromagnetic field. Some ten years ago, a new interpretation was given to this non-symmetric Einstein theory by Damour and Deser. I again had a look at it, but the equations still seemed to me too difficult to study. I understood why in 1951 I preferred to pursue the mathematical work I had started. It was to find for Einstein’s equations in higher dimensional space times properties analogous to the ones I had found for four dimensional ones. The problem is not trivial, since dimension four leads to quite special properties of spacetimes (it may be why we live in them), but the problem is mathematically well posed, and the obtained results are clear cut. In spite of my lack of enthusiasm for his unitary theory Einstein continued to be very kind to me, as an old man to the young woman I was then, but also as a genial physicist to someone eager like him to understand something of the world we live in. He was quite open minded; he told me once as I left his office after some discussion on his last theory “all that is perhaps the wrong direction”. I left Princeton at the end of 1952, earlier than was planned, because my husband and I were both offered posts of professors in Marseille, a rare opportunity. Leray encouraged us to accept, and Oppenheimer, director of the Institute, said kindly we could come back later to complete our stay. I went to say goodbye to Einstein; he was kind as usual and gave me his “best wishes for your teaching job”. I was rather disappointed at these wishes, I would have preferred best wishes for my future research. When I left his office, I regretted that I had not come more often. I thought I would do it next time. But when I went again to Princeton in 1955, Einstein was no more. Text is copyright Yvonne-Choquet Bruhat. Reproduced here with permission. This entry was posted in News and tagged Choquet-Bruhat, Einstein, general relativity by Adam Day. Bookmark the permalink.